This is a model of a new droid in Star Wars universe, it first appears in Episode VII : The Force Awakens (2015). When I see the first trailer of the movie which this ball like droid appears, I want to make it but the complexity of the sphere curve made me to put a side that project for a while. It's hard to make an easy template but still looks good, until our friend Fidel Olmos Aaron from Venezuela send me his template of BB-8 droid to me. The 2 sheets template is in PDF and PDO which also the assembly instructions. The scale of this model is 1:6 according to Fidel. 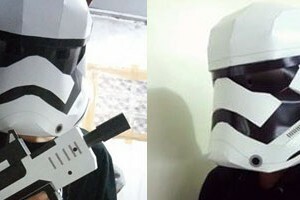 There are some requests for wearable new stormtrooper helmet, the First Order one. I know someone already made it, and the template already around on the net, but with the release of the 1/6 papercraft figure, I think why not I enlarge the head alone into wearable helmet. At first I send the enlarged template to 3 of my friends in Peri Facebook group to be built as test build. The result was everything looked good just need a little bit adjustment on the texture alignment on a part. The template for test build was originally in A3 format (6 pages), but for the release version I break some of the parts to fit into A4 paper (9 pages). You can use assembly instruction from heavy stormtrooper. The helmet it's not exactly 1:1, because I enlarge it 5 times instead of 6 times. So here it is, you can build it for Star Wars Episode VII The Force Awakens premiere :D.
This is my first papercraft after several months in hiatus, exploring "another world" :). This December like everyone know is a special month, new Star Wars movie will be release! I have high expectation on this movie, specially because JJ Abrams is the director. At first look, I think the new trooper is fine, but still not cooler compare to original trilogy's trooper. But the more I look and appreciate, I have to say, I take it back. 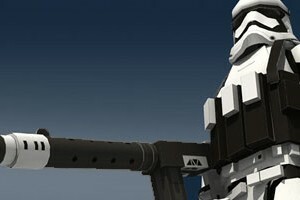 Specially the heavy trooper, it's awesome. That's why I made the template of it. The heavy stormtrooper from my observation is basically very much the same with the regular stormtrooper without their tactical vest, a pistol and a big gun. The template consist of 8 pages and the scale is 1/6 ( 30 cm / 12 inch). Chopper is one of the newest characters created in Star Wars universe, he appear in the new Star Wars Rebels animated series that is air on Disney Channel. My 3 years old son immediately know he was a part of Star Wars, maybe because the similarity shape as the R2D2. 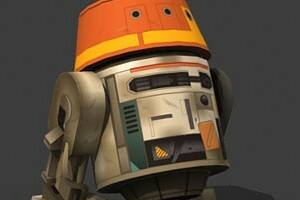 If I have to build an Astromech droid RC, I will choose Chopper instead of R2D2, I think he is easier to make :). But that's a long way to go, so let's start with the paper craft version of it, so this is a PR version of him. 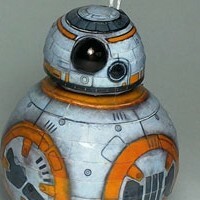 Chopper Cylindrical body is about the same diameter compare to R2D2 but a bit shorter. The head, instead of a dome, it is like a chopped cone. The personality is also quite different, R2D2 is more cute, Chopper is more wild. The paper craft template consist of 5 pages of patterns. The scale is the same as the previous R2 which is 1:6. This is my first model in 2015. I usually break a figure paper model into several parts, but this time I release the template in just a file. Perhaps there will be a blank template for it, if I got the time. A Sandtrooper is a desert stormtrooper. 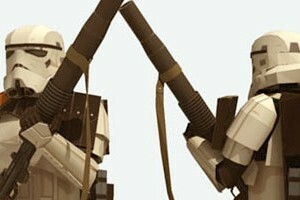 Sandtrooper armor looks the same as their fellow the other stormtroopers, but with a little bit different in detail. They also have distinctive dirty looked or heavy weathered instead of shiny armor like the stormtroopers have. Their first appearance was in Star Wars IV : A New Hope. Sandtrooper also wore pauldron. Each pauldron color represents a military rank. This orange one is representing a squad leader, which usually consist of 7 desert stormtroopers. When on duty, the squad usually bring heavy weapons and backpacks with them.